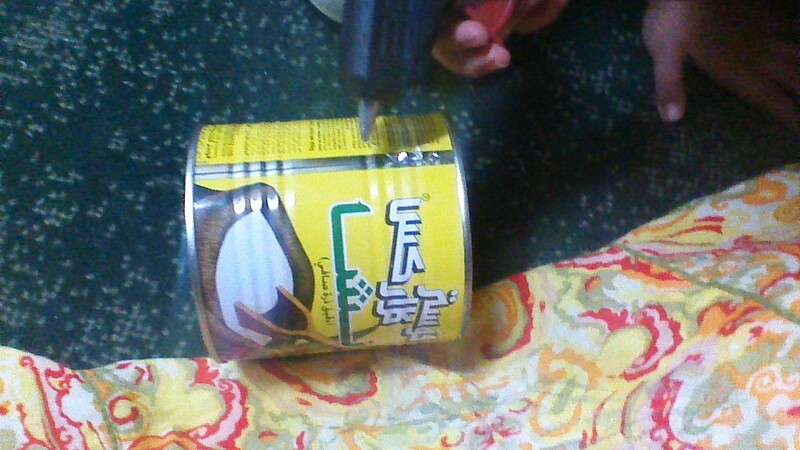 The third activity on our list was making a Sadaqa Jar. We did this activity last year as well. But this time we used different materials. We have been talking about recycling and reusing for sometime. So this was a good opportunity to reuse some of the stuff I have been saving. So let's get on to it. We used an old tin. Last time we used a Pringle box. Anything can be used really, a cerelac tin, old mayo bottle, a tissue box even. Decorative wrapping paper. Again many things can be used. Plain paper, decorative tissue, paint, crêpe paper. Anything that's available. Even different bits of paper. Shiny pipe cleaners. We used these for writing on the jar. You can use markers, paint. 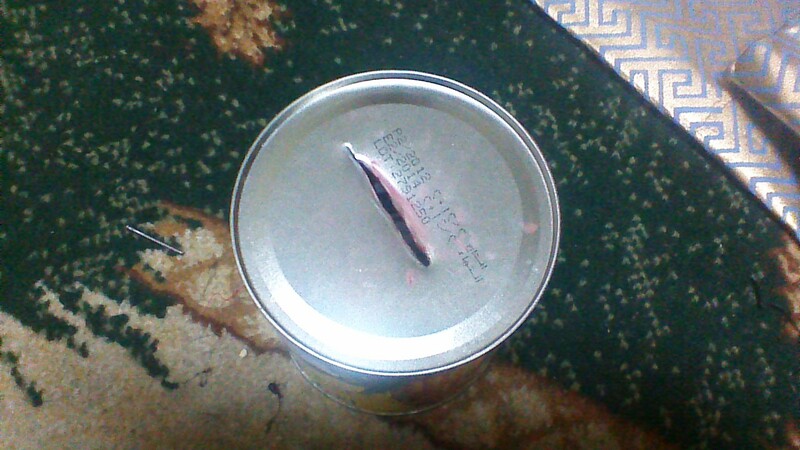 Ok, the first thing swe did was to make a slot at the bottom of the jar. I got my husband to help with it. He used a knife and a hammer to do it. If you know a better way please do share. Next we covered the whole jar with the wrapping paper gluing it down as we went along. Let the glue dry for a bit. Next we shaped our pipe cleaners into letters and glued them down. 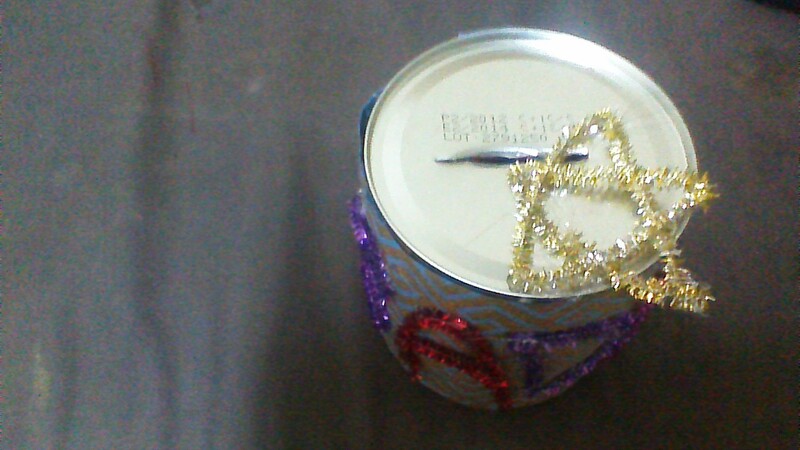 I made a pipe cleaner star for the top of the jar. Finished. Ask your child to collect sadaqa from dad and mom. Social skills: While making the jar we discussed about the people who might need sadaqa. Why it is important for us to collect and give to the right people. English: After finishing the activity we wrote down the spelling of the things used for the activity. Urdu: We talked about the sounds we could hear in the word Sadaqa and wrote them in Urdu. Fine motor skills: Shaping the pipes into letters help develop and enhance motor skills. 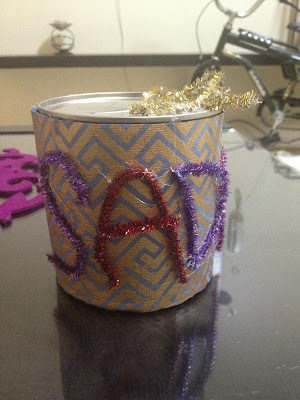 While doing the activity ask the kids what other materials could have been used to make a charity box. Teach about recycling and reusing. Show them videos about how the waste is destroying the earth and how we need to be careful about how we use stuff. Talk about how Mohammed PBUH talked about conserving water, hence teaching us to be very careful in how we manage our stuff. And again, the purpose of the activities are to teach children new concepts and ideas. Let them be in charge of the activity. It does not need to be perfect. Hajj & Umrah Packages 2017.